Titles include Alpha Flight #2, Amazing Spider-Man #506, Avengers/Thunderbolts #2, Captain America & The Falcon #2, Exiles #45, New X-Men #155, Thor #77, Uncanny X-Men #442, Wolverine #13 and Wolverine: The End #3. Titles include The Authority #11, Enginehead #1, Hard Time #3, The Monolith #3, My Faith in Frankie #4, Plastic Man #5, The Sandman Presents: Thessaly -- Witch For Hire #3, Swamp Thing #2 and Y: The Last Man #21. 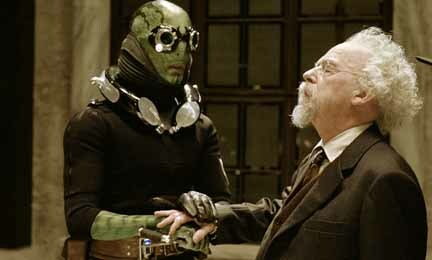 John Hurt is a dead ringer for Professor Broom in the Hellboy movie, creator Mike Mignola said. "John Hurt as Broom looks exactly like the character in the comic book," Mignola said. "At times I thought I must have looked at a photo of Hurt when I drew this guy. It was spooky." Hurt, who has starred in such films as Alien and The Elephant Man, said he came aboard Hellboy for two reasons. "Guillermo (del Toro) is a director I admire tremendously," Hurt said. "Also, it's the kind of movie I'd never made before -- a fantasy piece with touches of human emotion." Broom, an expert in the occult, rescued Hellboy and decided to raise him as a son. "Broom anchors the story," said producer Lloyd Levin, "and it was our tremendous good fortune to get John Hurt to play him. He gives the character a kind of gravitas. He makes Hellboy understand that, in life, even the oddest creature has a purpose.�"
* Jeffrey Tambor, who plays Tom Manning, appeared on Live! with Regis and Kelly on Thursday. "We opened it two days aga and people were actually screaming," Tambor said. Tambor described his character as the "cranky pants" of the movie, and a scene featuring his character and Hellboy was shown. Look for more Hellboy news on Friday here in The Continuum. Devil's Due Publishing has added a new packaging company, Dynamite Entertainment, to its roster and in July will release Army of Darkness #1. Army of Darkness #1 features the creative powers of writer Andy Hartnell and artist Nick Bradshaw and cover artists Marc Silvestri, J. Scott Campbell, Ben Templesmith. Other Dynamite packaged projects, scheduled for later this year and also included as part of the overall relationship with Devil's Due, include brand-new projects from such creators as John Byrne and Jim Starlin. "I've been nothing short of incredibly impressed with what Josh (Blaylock, president of Devil's Due Publishing) has put together since striking out on his own," said Nick Barrucci, president of Dynamic Forces. "When we got the license for the comics -- as part of the package with our license to do trading cards, lithos and statues -- we knew we needed to have a cool publisher release the dynamite series. Now, with the creative teams involved, we're ready to send Army of Darkness straight to the top of the sales charts." Said Blaylock: "Army of Darkness is something we've wanted to do for a long time, and I'm psyched that Nick chose us as a packaging partner. Adding legends like John Byrne and Jim Starlin to the list was icing on the cake, and I can't wait to see what they do. It's an honor to have them published under my label." The WB has announced that the Wednesday, April 14 episode of Angel will be "Underneath." Look for more Angel news soon here in The Continuum. Vixen will appear next season Cartoon Network's Justice League Unlimited animated series. Coming Friday: Image news -- and much more!! !